REDONDO BEACH — Over the years, California Department of Fish and Game wardens have come to know the spots poachers frequent to illegally take lobsters before the season opens. King Harbor’s breakwall provides a great lobster habitat — and because of its easy shoreline access, its attraction to poachers is seemingly irresistible. “It’s been a trouble spot for decades,” said DFG law enforcement officer Patrick Foy. On Sept. 29, two days before lobster season officially opened, wardens Michele Budish and Kory Collins surveyed the area and said they watched as five men poached lobsters along the rocks for nearly four hours. At around 2 a.m., the five men loaded the catch into a pickup truck. There, the wardens stopped them and recovered the “bugs” — many of which were shorter than the legal limit. Wardens watched as the men reportedly used their hands, nets, flashlights and traps to corral the lobsters. 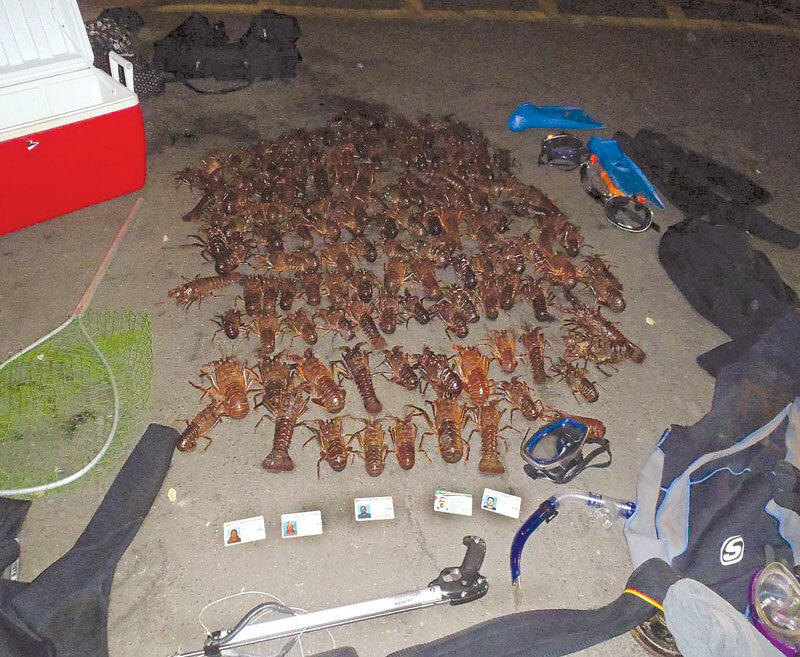 Their gear was seized as evidence, and the five men were arrested on charges of gross overlimit of lobster and possession of lobster for commercial sale. All five pleaded not guilty to the charges. Arrested in the incident were Ramon Gonzalo Montes, 28; Omar de Leon Aguilar, 26; and Juan Manuel de Leon Haro, 34; all from Los Angeles; and Augustin Granados, 67; and Ruben Flores Jr., 38; both of South Gate. Budish and Collins returned to the King Harbor jetty the same night and worked on four more lobster poaching cases totaling 13 additional poached lobsters before sunrise. All lobsters from the night’s cases were photographed as evidence and successfully returned to the ocean. “Experience tells us that if you relieve the patrol pressure in an area, poaching will immediately resume,” Foy said. With the season now open for recreational fishing, DFG wardens are on the lookout for illegal lobster activity — such as fishing or diving without a California spiny lobster report card, or raiding of commercial or recreational lobster hoop-nets. One deterrent put in place for lobster stealing: If a lobster thief steals lobsters that are valued in excess of $100 from another person’s trap, it is a felony. Foy said the rule is based on agricultural law. The peak of lobster season action is at the beginning of October, and, consequently, DFG wardens see the most lobster poaching cases early in the season, as well. To report lobster poaching, call CalTip at (888) 334-2258.